It’s your life. What are you choosing to do with it? Six years ago today, I embarked upon a new phase in life as a software engineer at Google, my first full-time professional job. In my time there I worked hard (but not too much), learned a ton (and in more ways than I ever expected), and set up a great foundation for my life. 8 months ago, I left the company. Although working there was as good as it gets for a corporate job, it still meant putting my efforts towards other people’s dreams. I was ready to place all my energy behind my own passions, and privileged enough to be in a position to do so. At the time of this shift, everyone asked me “what’s next?” and I told them that I didn’t have an answer for them yet. I didn’t expect to know what was next, but I knew that it would become very obvious if I pursued my passions in earnest, while meticulously being mindful of the latitude of my skills and how they can be applied to give people something of value. I set a goal to figure out what’s next by the end of that summer, and make it “what’s now”. I set off on planes, trains, busses, road trips, and of course my skates. My travels during the summer took me to Virginia, Washington DC, Philadelphia, Boston, Ohio, San Francisco, Nebraska, Chicago, Massachusetts, Minnesota, Burning Man, and back home to New York many times. I spent time training in various disciplines of skating, from practices, attending workshops, and receiving a certification. I competed at many events. I became an ambassador for the art of skating and took the time to show off its beauty in real life and through social media. I brought my skating to the performance arts side, starring in a music video, performing at a roller rink, and getting an extra role for a TV show. I was recognized by and received assistance from multiple skate equipment companies. While it was a busy summer with regards to travel and events, it wasn’t so busy overall and intentionally so. I incorporated a lot of downtime and buffer time to slow down my life. This was necessary as part of a great reset, and to give my mind the opportunity to sift through possibilities. I made time to take care of myself, see friends, and expose myself to different communities. By the end of the summer, points of clarity emerged. I sought to live a modest and flexible lifestyle involving plenty of travel and physical arts. While this lifestyle isn’t compatible with working at a corporation, it does fit well with the growing “gig economy”. And outside of the physical arts, I still enjoyed coding and creating software, so I had options. A plan emerged to blend my passions and expertises. Since September, I’ve been hard at work making a new life behind the scenes. 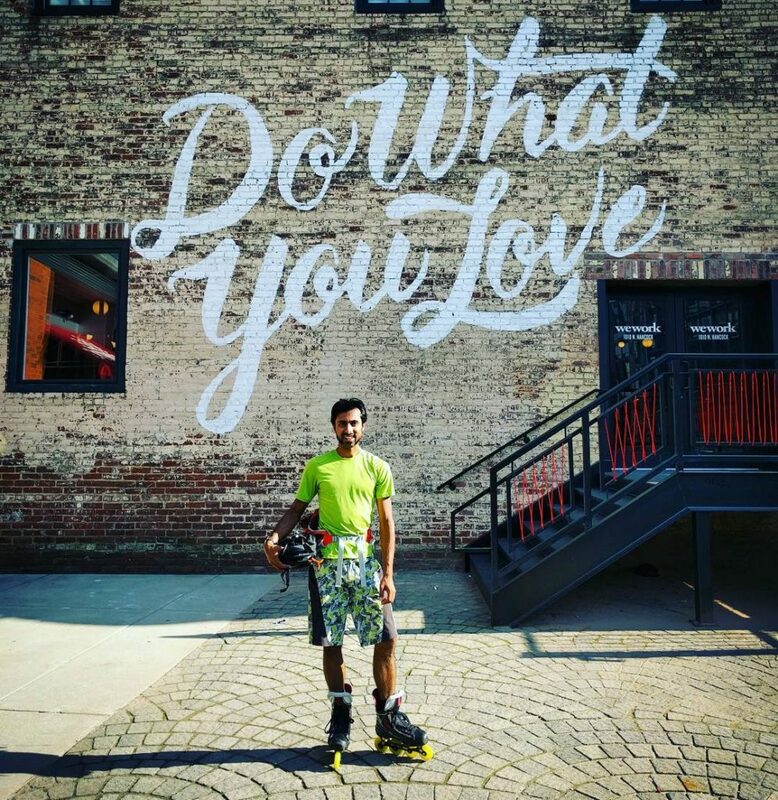 I founded my own company, Kinetic Expression LLC, to represent my work in the realms of professional skating and software engineering. For the former, it means more on the performance arts and teaching sides. For the latter, the first big project is a software app that serves as a learning platform for physical arts, including skating, personal training, dance, and basically everything else. This particular idea was conceived during a car ride with some amazing skater friends, and after months of developing it as a one-man team, I’m proud to say that it’s about ready for beta release. On the gig side, I’ve also joined the ranks of 10x Management, which is a company that matches high-end freelance tech workers to short term software jobs. It’s always scary to make a big change in life and especially so when you don’t know what’s next. But the gap time is necessary to explore and figure out what you want, what you can offer, and the opportunities that fit in between. Had I jumped into another role right away, there’s no way I would be in this remarkable place right now. I’m excited for what’s to come. And I’m excited for what’s now.